Title: 'Novus Orbis sive America Septentrionalis divisa per fua Regna Provinc et Insul'. 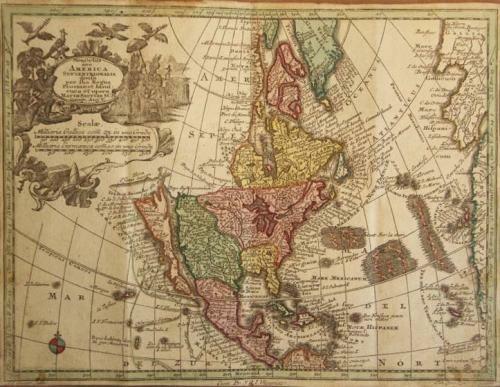 Seutter's very detailed and decorative map of the continent of North America from 'Atlas Minor' published by Thomas Lotter, Augsburg, c.1750. A very interesting map of North America with a rather late view of California as an Island. Perhaps the last map of California as an island to present a major cartographic change. The island narrows almost to a point in the southern portion of the island, following the theory introduced by Father Louis Velarde. The Hudson Bay is portrayed as a long narrow waterway that connects with Baffin Bay. There is an ornate cartouche at the top left, with a depiction of indigenous peoples. The map is in very good condition with minor margin toning and rubbing and a 1 cm centerfold tear. Folds as given.